Rolea B’ier-Kompong Chhnang: Although there is no clear claim to show the exact number of workers and the soldiers from the East Zone were killed during the construction of an airport in Krang Leav commune, Rolea B’ier district in 1977, it is known that tens of thousand were brought to be killed at the time. 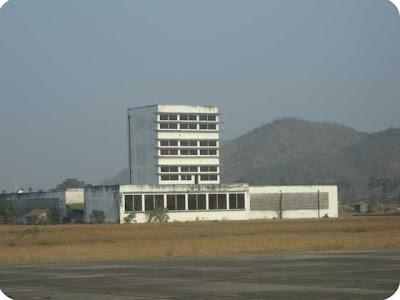 The airport in Krang Leav commune, Rolea B’ier district is located more than 10 kilometres from the provincial town of Kompong Chhnang and was built in 1977 during the reign of the Khmer Rouge by the workers who were the “base people” and the soldiers claimed to have come from the West Zone, under the supervision of Chinese specialists. The labourers, who were in the lowest class, and tens of thousand soldiers sent from the West Zone broke rocks from Krang Dei Meas Mountain to get granite for the construction of the airport, being built day and night. A smooth concrete road leads from the junction of the National Road Number 5 to the airport, and from the airport to Krang Dei Meas Mountain, there are also concrete roads intertwined. Around the flank of the mountain, there are many water reservoirs, which is claimed to be have been used to keep water for the use in the airport. A lot of buildings were constructed along the flank of the mountain to the airport. Thoang Sim, Krang Leav’s commune chief, said that during the Pol Pot’s regime, he lived near the airport construction site. However, he was not appointed to participate in the construction since he was not the base people. “Only the base people and the soldiers sent from the West Zone were appointed to extract the rock for building the airport,” he said. He does not know how many people the Khmer Rouge killed during the airport construction “campaign”, but saw in the evenings militiamen walk lines of airport construction labourers to be executed. “It was said that the Khmer Rouge did not want anyone to know about the confidentiality of their strategies in Krang Dei Meas Mountain, so after the construction they killed [those labourers],” said the commune chief. The commune chief said that the Kompong Chhnang airport is 3 square kilometers and at the present around 100 families have been residing in the prohibited area. He continued to say that the provincial authority had previously evicted the people living there, but that after the UNTAC came to Cambodia, they returned to live there again. Many villagers said that although many people were killed during the stage of the airport construction, but the number of the dead was unknown. Thoang Sim said that in late 1978 when the Khmer Rouge knew that they were going to be defeated, they burned the factory, oil, and other remaining materials they could not take along with them before they retreated and fled into the jungle. Sacravatoons : " Hun Xen,you're next ! "